To edit an existing Widget, long-press on the name of the widget, wait for the menu to appear, then tap Edit Widget. On the Edit Widget page, the check boxes on the right-hand side can be used to select what does and does not appear on the dashboard. You can also rename the widget to accurately describe the device, event, or camera being controlled. If the device in the Widget is a binary on/off device, you will have a Widget Behavior section at the bottom, where you will see Use as toggle. This will turn a binary on/off device into a toggle switch as opposed to two buttons with one for On and one for Off. From here, you will see a sample image of a widget. Click the eye symbol in the various sections to hide or show the different properties of the widget. Click Save in the upper right corner to save your changes or Cancel in the upper left corner to discard your changes. 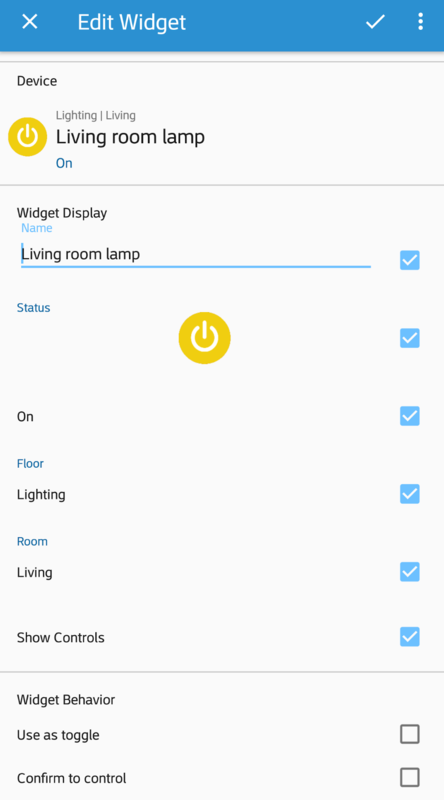 If the device in the Widget is a binary on/off device, you will have a Widget Behavior section at the bottom, where you will see Use as toggle.This will turn a binary on/off device into a toggle switch as opposed to two buttons with one for On and one for Off. You can also adjust the width of the widget, the height cannot be adjusted.